My friend Julie is very creative. She teaches art and jewelry classes. She is always packing up supplies and bringing it to the various places she teaches. For her Birthday I decorated an old suitcase for her to carry her supplies. And yes it did freak me out a bit to paint over it .. it is vintage! But I think I made it really cute...so here is what I did.. I took the suitcase out side and spray painted it with a primer spray paint from Home Depot. Once it dried, I painted it with an eggshell paint I got at Home Depot. I used the small samples they can make the color you like for about $3. I used a Tiffany Blue kind of color.. I can't remember the actual name but the Tiffany color was what I was going for. Once it was dry...I used some Wallies wall paper flowers and Mod Podge to decorate the suitcase. Thank you for your visit and sweet comments. so glad you stopped by so that i could find you. what an amazing transformation. 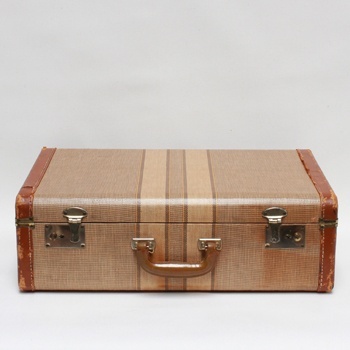 your suitcase is so pretty. I'm sure you made your friend July very happy with your gift.